Here’s the Final Prayer of the Pentecost Novena to the Holy Spirit! I bless the Holy Spirit for answering my prayers. During the Pentecost Novena, I had a revelation, an answer to my prayer. I confirmed it today. Thank you St. Joseph, Our Lady of Fatima, The Holy Spirit, Divine Mercy, for helping us find a better job in another city.Thank you for answering our prayers! Thank you, we are so grateful! Thank you Lady of Fatima for blessing my nephew with a job. Please continue to pray for my niece. She needs you. She needs your Holy Son. She needs a miracle healing from you. Please heal her of all cancer and cancerous cells, stems, roots and tumors. In Jesus Christ’s name. Amen. Thank you Holy Spirit and Mama Mary for all the blessings. Praying for abundance of work in my carreer and help me able to settle all my obligations , debts and daily needs. I thank the Holy Spirit and Mother Mary for answering my prayers and assisting me in my financial needs. Oh Holy Spirit I pray for weightloss in my son. Oh Holy Trinity you know his family need and love him!! His excessive weight may deteriorate his whole self!! Please pray with me that he may take control of his cravings!!! 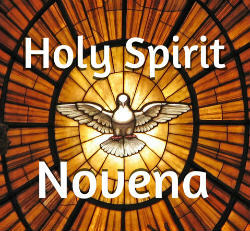 I thank God the Father, God the Son God the Holy Spirit for answering my novena prayer to the Holy Spirit. Thank-You Lord Jesus for everything I have! I have been blessed with abundance in my work, for that I am grateful. I share your pain. My husband & I have not seen our son in over 4 years. We have 2 grandchildren who they keep away from us. His wife wants nothing to do with us. With God’s help we continue to have hope. I pray the same for you and May this novena bring answers for all of us. May God bless you. thank you holy spirit, for filling our heart with your love. I am so thankful to the lord. I have been keeping this novena for my husband so that he can stop drinking and smoking. And on the last day of the novena, he told me that he had stopped the smoking so that he can be more healthy. I am very happy and thankful to Lord for this miracle. please stay with me and with my family, forever and ever. We adore you dear Holy Spirit! Stay with us and stay with our families forever! Please hear all of our prayers, and with much love and gratitude, we surrender ourselves to Thee! Send us your beautiful gifts and set us on fire with a profound love for the Holy Trinity! We sinner’s dont thank you enough. We need too call on you more for help. We pray for the Souls whom left the church, and ask you Holy Spirit too bring them back. ..PLEASE !!!! thank you for all the good you gave us, but please save my family who came to you with trust and love,save us, unite us,give us a future, we want to love you more, serve you more and glorify you more. In Thanksgiving for an answered prayer request. Half way through the novena the litigation against our company went in our favor. Thanks be to God!!! Guide me in the right direction to find happiness. In Jesus’ name. Amen. It has been an awesome experience praying this novena with each and every one of you. May all the desires of our hearts be delivered through this powerful novena. Thanks for your faithfulness in praying with me. GOD says that anytime two or more join together in prayer it is done! God Bless! May the Holy Spirit fill our family with great care and love to dismantle the chains of the satan and all his work of the great enemies who pretends to be my wife’s friends who interferes with our family life through the incitement and false accusations about me. May He intervine with His Divine wisdom to scatter all those evil incitement to be thy pure love to the whole family, LORD gracious hear my prayers which I am making here at this moment, Amen. I pray to the Holy Spirit for contentment with my life. The strength to make it better and to become a healthier person in mind, body and spirit. for the most abandoned souls in Purgatory and for the healing of our family ancestral tree that they may all rest in peace in God’s Heavenly Kingdom; for our country, our military and our president; for our country to return back to One Nation Under God; for the conversion of sinners and salvation of souls; for the sanctity of life, marriages and families; and for all of God’s living creatures especially those abused and neglected; for all priests and for the hungry, homeless, sick and the poor, and for my family. May the Holy Spirit Fill my home. Prayers for my marriage. My husband and myself. I pray he will think about what he is doing to us. I pray I can look beyond the sadness and try to understand. I ask for Mercy and Grave. Lord you know the desire of my heart. Pls hear my prayer. In the mighty name of Jesus i claim that things will happen according to your will. Amen. Thank you for the strength and balance you give my boys in transition to adulthood especially for my son with anxiety. Please grant him the peace he deserves and help us to help him as well. Thank you for the answering of all our prayers and for the opportunity for my husband to flourish in his business. I am so sorry for your loss…. :'( Hoping you get peace from knowing he is on his way to Jesus…God bless you. Special prayers for you at the loss of your beloved husband and for the peace of Jesus to bring calm to your aching heart. Heavenly father I come to you today to pray for me and my family. Pray for prosperity, weightloss, better health, find a way for me to go back to school, find a way for me to help free my mother from her hateful husband. Pray for me to find a job in the medical field so I can stop working two jobs daily. Pray that I get a new automobile with less issues and costly repairs that I did not do before the purchase. In Jesus name I pray amen thank you heavenly father for all you have done for me and my family and continue to watch over us in our journey in life. Please pray for my 7 year old son Kolbe Peter who has arthritic Lyme and our Ray who is five who we are trying to adopt???????????????????????? Holy Spirit, Soul of my soul, I adore you! Thank You for being with me all through my life, inspiring my good decisions and helping me to correct and repent for the bad ones. Thank you also for giving me a healthy fear of God so that I’ll remain ever faithful and loving. Thank you for lifting me up in good times and comforting me during difficult and sorrowful times. Thank You! Thank You! Thank You! me to a manual wheelchair and housebond . I pray for my own family , my wife Catherine and daughter Lauren who have both helped me through this terrible ordeal . Help me make amends in my attitude to all things dear to me . I’m praying for you. ???? I pray that my family and myself will be able to take care of our health. Be with us Lord help us every step of the way . I ask you dear Lord to make a life change with my household. I need a financial break through. I nned my house, I need to open savings accounts for myself and my chikdren. I asked for a good deed to come my way. Amen. Dear Holy Spirit, please grant me that one petition I have been praying for and take care of our and all people’s investments. Pour Thy Divine Spirit on the above so that all is well at our end. Still asking God to have mercy on me and bless me with a home and family. I pray to be a mother of children, this has been my prayer for the past 16 years. I have prayed this novena, and will continue to pray for Your will to be done for Alan and me. Please lead us and guide us, so that we may know what to do. Give us the strength to make the right choices and to accept them. Thy will be done for us. In Jesus’ name. Please pray for all my family to come back to the Church!